Oh! A plan! 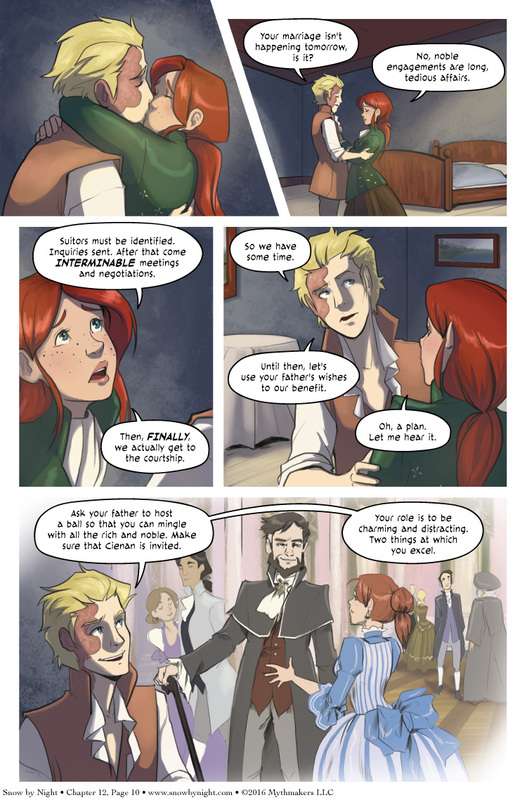 Jassart and Vivienne plot on Chapter 12 Page 10. While her father may indulge her with the ball, she’s almost certainly going to be engaged to a noble back in Saronne. There’s no one in Aradie who is her equal or will benefit the colony in the upcoming war. To see a key part of Jassart’s plan, please vote for Snow by Night on Top Web Comics. I love it. Definitely was needing some more fun thieving escapades all up in here! I know Jassart is using Vivienne, but what about the opposite? Spoiled or not, V is no fool. I wonder who will backstab the other first. Come, come, Cienan would never wish to stab his Intended Bride and Master Aquisitor! remember toward the beginning he has a steep price and that right there can be a vicious stab. I’ll take the long bet and go further with my previous theory and say a certain Defiant one shows up at this ball with Blaise as coach for how to act.